The LVCN-11 & LVCN-12 series have been discontinued. Please contact our Flow Engineering department for a viable replacement. This durable electrical housing conveniently mounts on top of an OMEGA ® sensor or on OMEGA’s sensor track system. It provides termination for up to four sensors. The housing swivels on its base, allowing easy alignment for conduit installation. 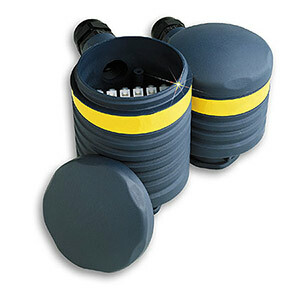 The housing is made of rugged reinforced polypropylene and meets NEMA-4X ratings. The LVCN-12 compact version provides termination for up to 2 sensors.